Police searching for a mum-of-three who was feared to have drowned after getting into difficulties when playing in a river with her children have found a body. The woman, thought to be in her 30s, was last seen more than 14 hours ago when she was diving into a shallow part of the River Great Ouse in Bedford. A body of a woman was found today after assistance from fire fighters and specialist divers from Norfolk Police. Here's Chief Inspector Nick Lyall. Neighbour Joe Vacchio said there were screams of "I can't swim"' before police and a helicopter arrived. He said the woman lives around the corner from the river and had been diving into the water off small islands with her three children. Mr Vacchio told the Press Association: "The children and their mum were playing in the river. They were diving off into the river. There were screams that my wife heard of 'I can't swim' and that was it really. She hasn't been seen since." He added that his wife believed the screams came from the woman. After police arrived at about 8pm, Mr Vacchio said he saw the three children sitting by the river wrapped in towels. He added that the river was "murky" and had holes up to "20ft deep". "I have lived here 20 years and I've never been in that river. It's very, very dangerous and very, very unpredictable," he said. He said a relative knew the woman involved and had warned her not to go into the water with her children. "She didn't heed the warnings and it looks like she had paid the ultimate price," he said. Mr Vacchio said the shallow part of the river is around knee or shin height during hotter summer months when it gets busy with families playing. He added there were no warnings or signs telling people to be careful or not to swim. 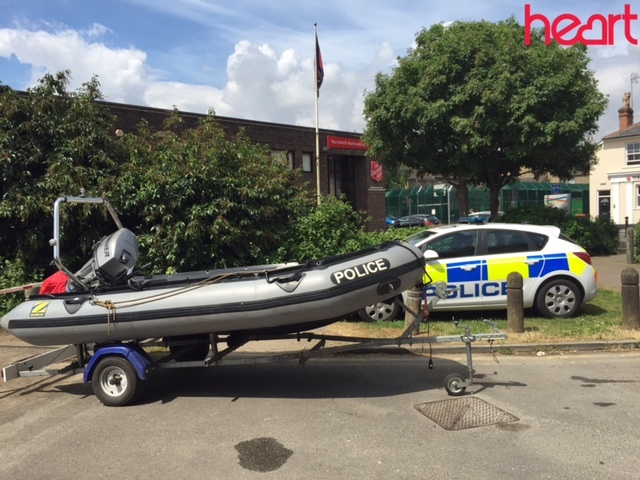 Police said it is believed the woman entered the water to help someone else who was in distress and then got into difficulties herself. Officers were called to an area of the Great Ouse off Honey Hill Road at about 8pm - they were later assisted in their search by the fire service and the police helicopter. Next of kin have been made aware and police are supporting the family.